At the invitation of Premier Li Keqiang, Prime Minister K.P. Sharma Oli of Nepal will pay an official visit to China from June 19 to 24. China and Nepal are comprehensive cooperative partners with ever-lasting friendship. The China-Nepal relations have always enjoyed a sound momentum of growth. The two sides support each other on issues concerning each other's core interests and our mutually beneficial cooperation across the board is developing rapidly. This visit is Nepali Prime Minister's first visit to China after Nepal's political transformation, which will provide important opportunities for the leaders of our two countries to chart the course for and guide the development of China-Nepal ties. During the visit, President Xi Jinping will meet with Prime Minister Oli and Premier Li Keqiang will hold a talk with him. China hopes to take Prime Minister Oli's visit as an opportunity to deepen our practical cooperation under the framework of the Belt and Road Initiative and enhance cooperation in such areas as politics, economy and trade, infrastructure, post-disaster reconstruction and cultural and people-to-people exchanges so as to scale our bilateral ties to a new height. At the invitation of State Councilor and Foreign Minister Wang Yi, Foreign Minister Mevlüt Çavuşoğlu of the Republic of Turkey will pay a visit to China from June 14 to 15. In recent years, the China-Turkey relations have been growing steadily with frequent high-level exchanges, ever deeper economic and trade cooperation, colorful cultural and people-to-people exchanges and close communication and coordination on international and regional issues. During the visit, State Councilor and Foreign Minister Wang Yi will hold talks with Foreign Minister Mevlüt Çavuşoğlu, during which they will exchange views on bilateral ties, cooperation in various areas and international and regional issues. China stands ready to work with Turkey to move forward the China-Turkey strategic relationship of cooperation. 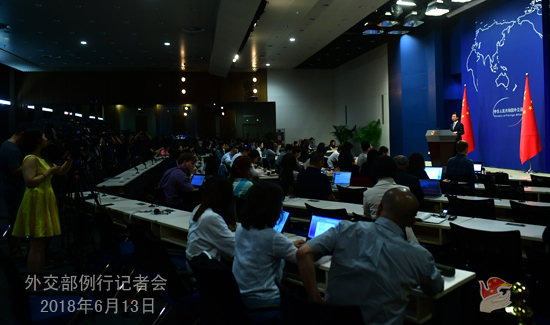 Q: China has released the information on US Secretary of State Mike Pompeo's visit to China on June 14. We noted that this will be Mr. Pompeo's first visit to China since he took office. What topics will this visit focus on? What is China's expectations for it? A: At the invitation of State Councilor and Foreign Minister Wang Yi, US Secretary of State Mike Pompeo will pay a visit to China on June 14. The two sides will exchange views on bilateral relations and important international and regional issues of mutual interest, and the US will brief China on the US-DPRK summit in Singapore. The sustained sound and steady development of the relations between China and the US, the two major countries, serves the common interests of the two sides, conforms to the interests of the world and is consistent with the shared aspirations of the international community. This visit is an important high-level interaction between the two sides in the near term. 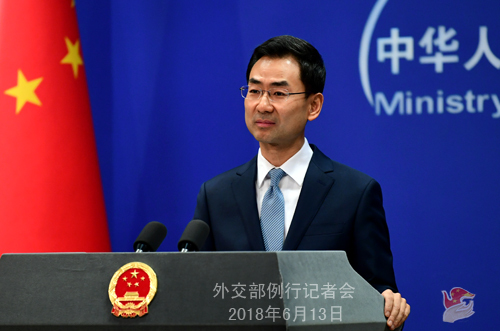 China hopes that Secretary of State Mike Pompeo's visit will further help the two sides to enhance understandings, manage differences and expand cooperation between the two sides, and move forward the China-US relations in the correct track continuously. Q: On June 12, the DPRK-US Summit was held in Singapore and a joint statement was issued, which promised that the United States would provide security guarantees to the DPRK and the DPRK would firmly commit itself to the denuclearization of the Korean Peninsula. We have noted that the international community generally holds a positive attitude towards the outcomes of this summit. However, some people believe that the DPRK has not made substantial concessions and that because the statement has not specified the concrete measures and timetable, the follow-up implementation remains an arduous task with limited substantive significance. What is your comment? A: With regard to the DPRK-US summit, China's Ministry of Foreign Affairs already released a statement yesterday afternoon. I would like to reiterate here that the successful DPRK-US summit and its positive outcomes represent the important headway in promoting the denuclearization of the Korean Peninsula and the political settlement process of the issue. We highly commend the political decisions made by the leaders of the DPRK and the United States, welcome and support the outcomes achieved at the summit, and speak highly of the efforts made by all relevant parties to ensure the success of the summit. Well begun is half done. We believe that it is of momentous and positive significance in history for the top leaders of the DPRK and the US to sit face-to-face and engage in equal dialogue after hostility and confrontation over the years. The outcomes of the DPRK-US summit represent the right and important step taken towards achieving the denuclearization of the Korean Peninsula, ending hostility and confrontation and striving for the lasting peace and prosperity of the Peninsula. As the Korean Peninsula issue is complex and unique in itself, it can not be settled overnight. Instead, its solution calls for the perseverance, patience as well as unremitting efforts on the part of all relevant parties. We hope that the DPRK and the US could follow through on the consensus reached by their leaders, advance follow-up consultations, further consolidate and expand the outcomes, and make the political settlement of the Korean Peninsula issue a sustainable and irreversible process. China supports the efforts made by the DPRK and the US to this end. As a close neighbor to the Korean Peninsula and a major party, China is willing to join hands with all relevant parties to stay committed to realizing the denuclearization and establishing a peace regime on the Peninsula and make positive efforts and contributions for the achievement of the lasting peace and stability on the Peninsula at an early date. Q: Has the DPRK already done enough to warrant sanctions relief at the UN Security Council? Some said that there needs to be complete and verifiable denuclearization before there can be any change to the sanctions at the Security Council. What is China's point of view? Could there be some measure of relief or do we need the whole process of denuclearization to be completely finished before there can be any change to the sanctions? A: I suppose you were not here yesterday? I already took a similar question yesterday and you may refer to that on the official website of our ministry. 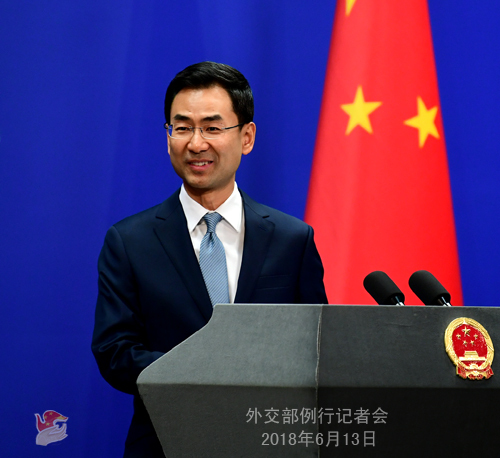 I would like to reiterate here that China always believes that the sanction itself is not the end, and all parties should lend support and cooperation to the current efforts for diplomatic talks and the denuclearization of the Peninsula to jointly promote the political settlement of the Peninsula issue. Follow-up: I was here yesterday. (Laugh) But there are still some confusions. From your comment yesterday, my understanding is that there needs to be some contributions from the United Nations Security Council towards this diplomatic process. Does it mean that there should be some change to the sanctions regime at the UN prior to complete denuclearization? A: Like I just said, China always believes that the sanction itself is not the end. If you read the DPRK-related Security Council resolutions thoroughly, you will come to the conclusion that those resolutions mainly contain two aspects: on the one hand, they impose compulsory measures on the DPRK; on the other hand, they call on all parties to resolve the Korean Peninsula issue through political and diplomatic means to uphold peace and stability on the Peninsula. We hope all parties will seize the opportunity of positive changes currently taking place on the Peninsula to take a firm step forward towards the process of denuclearization on the Peninsula and political settlement of the Peninsula issue. Q: Will China suggest easing sanctions at the UN Security Council? A: Like I just said, all parties should lend support and cooperation to the current efforts for diplomatic talks and denuclearization of the Peninsula to jointly promote the political settlement of the Peninsula issue. Follow-up: It sounds like that China will suggest easing sanctions? A: I believe I already made myself very clear just now. Q: Firstly, during Secretary of State Mike Pompeo's visit to China, apart from meeting with State Councilor and Foreign Minister Wang Yi, any other Chinese officials will he meet with? Besides the DPRK-US summit, will the China-US relations, especially the follow-up matters concerning the China-US trade talks be discussed? Secondly, Some scholars believe that with the improvement of US-DPRK relations, the US will have a stronger influence in Northeast Asia, forming a pattern of China encircled by Japan and the ROK which will weaken China's influence in the Northeast Asia region. What is your comment? A: Regarding the first question, during Secretary of State Mike Pompeo's visit to China, our two sides will exchange views on China-US ties and major international and regional issues of mutual interest. Like what I said just now, he will brief the Chinese side on the DPRK-US summit in Singapore. As to the specific arrangements of this visit, according to my information, our two sides still remain in communication in this regard. If we have relevant information, we will release it in due course. Regarding the second question, firstly, the improvement of DPRK-US relations is a good thing. China has been calling upon the DPRK and the US to address their respective concerns through dialogue, gradually build mutual trust and normalize their relations. Yesterday, the DPRK-US summit was held successfully with positive outcomes achieved. That is what China has been looking forward to and advocating. We welcome and support it. Secondly, as to the so-called influence in Northeast Asia, one's gains do not necessarily come at the expense of the other's losses. China maintains close communication on the Korean Peninsula issue and regional situation with all relevant parties, including Japan and the ROK. Our shared goal is to safeguard the peace and stability on the Korean Peninsula and achieve the lasting peace and stability of Northeast Asia. Q: At yesterday's press conference, you said that the current evolvement of the situation proves that the "suspension for suspension" initiative proposed by China has been materialized. US President Donald Trump also said that the US-ROK joint military exercises would be suspended at the press conference following the DPRK-US summit. Therefore, it is speculated that China had been notified by the DPRK on this in advance. What is your view on this? A: I believe you have all noted that prior to the DPRK-US summit in Singapore, there had been positive changes regarding the situation on the Korean Peninsula. The DPRK had suspended its nuclear tests and the US and the ROK had exercised restraint on joint military drills, which in fact amounts to the de facto "suspension for suspension" proposed by China. President Trump said that the US-ROK joint military exercises would be suspended at yesterday's press conference. All I want to say is that it once again shows that China's initiative is logical and feasible, which not only serves the interests of all relevant parties but also can address their most pressing security concerns. China's proposals on the Peninsula issue are simply tenable and will win the support of all relevant parties in the end. As to whether China had been notified in advance, I believe you are fully aware that China always maintains close communication with all relevant parties on the Peninsula issue and this is beyond doubt. Q: Have there been any meetings between China and the DPRK following the end of the Singapore summit? Any reporting back from the DPRK side to the Chinese side? A: As I just said, China has maintained close communication with the DPRK, the US and other relevant parties on the Korean Peninsula issue all along. The current situation on the Peninsula has shown a positive momentum. China stands ready to work along with other parties to seize the opportunity at this point, further strengthen communication and jointly promote the process of denuclearization and political settlement of the Peninsula issue. Follow-up: Did any member of the DPRK delegation stop off in Beijing on their way back to Pyongyang? Is any of them in China right now? A: I have no information to offer in this regard at this point. Follow-up: As to the US' decision to stop its military exercises with the Republic of Korea in the future, did you learn about that from the conference of President Donald Trump yesterday or had you received notification prior to that? A: It is China's long-standing and consistent position that the US and the ROK should terminate their military exercises. After the press conference, the following question is raised: According to reports, former Maldivian President Mohamed Nasheed recently said that China has created a debt trap for the Maldives and then used debt as a disciplining agent. None of the Chinese projects in the Maldives have been tendered and they are not transparent. What's your reaction to this? A: Such remarks are totally nonsense. The Chinese side has responded to those false allegations about China-Maldives cooperation on many occasions. I would like to point out again that throughout the years, China and the Maldives have advanced cooperation on infrastructure and projects involving people's livelihood on the basis of mutual respect and equality, which has played a positive role in transforming and upgrading the Maldives' economy and improving the people's living standards. The China-Maldives cooperation conforms to the Maldives' demand for and level of development, which attaches no political strings at all, not to mention any debt trap.